The Old Bro Network: Happy Holidays from the Old Bro Network !! First of all, thanks and best wishes go out to all of you Old Bro's out there who have participated in and supported this little project since it began a year ago. Our directory of contact info is now established and thriving, with close to THREE HUNDRED Old Bro's on the roster. I'm certain that we'll pass that milestone early next year, as Old Bro's continue to send in contact info on other Old Bro's. And, I'm also sure that the Old Bro Network will continue to evolve into something MORE than just a directory ..... stay tuned. Also, happy holidays to the newest member of the Old Bro Network, Duane Ruth (EpSig 1024). Duane is the regional manager in Santa Monica for American Solar Direct, the fastest growing residential solar power company in the country. So if you're interested in lowering your electric bills, drop Duane a note and say howdy. Duane's addition to the roster brings our total count of Old Bro's up to 279. 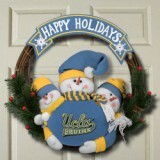 And an Old Bro shall lead them ..... Old Bro Network also wishes to send out out some holiday cheer to UCLA's new head football coach, Jim Mora, who is undoubtably hoping that Santa Claus can bring him a rocket-armed QB, a few grizzly bear type linemen on BOTH sides of the ball, and a crash course in how to defend against the spread offense. Looks like he's already got the "I can't believe we just scored" move down, hopefully we'll see this move on the sidelines FREQUENTLY next year. 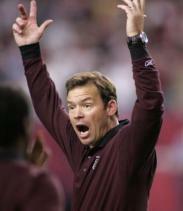 And if you didn't already know, Coach Mora is a member of LAMBDA CHI ALPHA (U. of Washington) ..... GO BRUINS !!! MERRY CHRISTMAS TO ALL, AND TO ALL ....... GOOD NIGHT ! !